In the past, men who took the time to have kits for grooming and actually take care of themselves were considered vain or sometimes, even too feminine for comfort. However, in recent times, so many men have gone past that and are paying more attention to their looks and personal grooming and as a matter of fact, the number of men caring for their grooming is rapidly rising as the days go by. These days, nearly every man typically has a grooming kit at home. Whether it’s just a bag where essential items like deodorant, toothbrush and scissors are kept or it’s a beard grooming kit that comes with all those tools for men with beards or moustache, a grooming kit is the one thing which has recently become a quite regular trend with so many men. Grooming kits come in different kinds and with different features offering a variety of functions. This article is a review of the Braun MGK3020 Multi Grooming Kit, a complete beard grooming kit for men. Here is all you need to know about this product. The Braun Multi Grooming Kit is a 6-in-1 Beard and Hair Trimming Kitwhich also comes with a Nose and Ear Trimmer. It is designed with an ultimate precision for styling your face and your hair and giving you just the look you want. It includes six different attachments so you can trim your hair, your nose, your ear, and your beard. Whether you want stubble, short beards, medium ones or long ones, this 6-in-1 Braun grooming kit will let you have them with ease. Even the ear and nose hair can be taken out without you needing to pull or tug at it. The blades are sharp and durable and will cut through your hair very easily without tugging or pulling at it, even if you have very thick hair. You also only need to charge this device once to be able to get forty minutes of precision trimming with no loss of performance. Just make sure that it is fully charged and you are good. It is also a very durable device so you can be sure it will stay with you for the long haul. This 6-in-1 grooming device is designed so it is very easy to keep clean as you can just wash its head and comb under running water and it will be fine. When you trim, make sure to trim against the natural direction of your hair. When you are clipping your hair, adjust the length from 0.5 to 21mm for any haircut/trim you want. Put light machine oil on the blades of the device from time to time in order to ensure that they continually stay in the best condition. 4 combs for beard trimming with which you can achieve any beard style as well as a precision trimmer to let you achieve a stubble, short, medium or long beards depending on what style you want. Six attachments for different performances like trimming your hair, your nose, your ears and your beards. Washable head and comb which will enable you to keep the kit clean. You can easily just wash the device under running water. Provide you with up to forty minutes of precision trimming without losing any performance. The blades are durable and will not require you to have them replaced. It is designed to last a long time from many years of use. It offers and can perform six different functions and effortlessly so. The blades are very sharp and can easily cut through very thick hair. It allows you to have any style of beard trimming that you want, because of the wide range of trimming lengths available. It can trim hair very neatly without pulling or tugging. Portable so you can easily carry it around or even travel with it if you want. Some people have complained that the button is difficult to slide on and off. 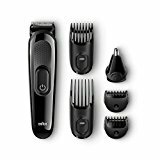 The Braun MGK3020 Multi-Grooming Kit is a good beard and hair trimmer which comes with just about all the features any one could want in a trimmer. The overall rating of it is just below 4 stars out of five and it is one of the most popular beard trimmers on the market. It is a very affordable model and will take care of trimming your beard, and if you don’t want to worry about price this is definitely a model to go with. For the price and money though we would recommend the Philips Series 3000 MG 3720/13.